When I established the nonprofit Smiling Calm Hearts Open Our Learning, Inc. (SCHOOL) over six years ago, I was excited to learn how to build the 501(c)(3) from the ground up just as I had built my yoga studio, Karuna Yoga, back in 2002. I knew it would take a lot of work and effort of which I was very eager to give to continue to bring SCHOOL Kids Yoga into public schools. I worked daily to spread the word in the community as I taught and with my circle of friends and family. Many people helped from donating time to consulting to web design and more. Still, SCHOOL, Inc. seemed to be a very tiny fish in a huge sea of strong well-established nonprofits that appeared to have so much more financial backing and strength. I was beginning to feel quite pressed for assistance that could in some way help me grow to the next level. Taking a hike one Sunday afternoon to give my brain some space to think, I reached the bottom of the trail and happened to cross paths with a lovely former student and now yoga teacher and studio owner. She was with her husband. I shared that I was at a crossroads - should I grow my nonprofit or perhaps call it a day and move on to some other type of work. My friend's husband suggested I reach out to Jericho Road. This was a superb stroke of good fortune as I soon realized. I called Melanie Goodyear, the CEO of Jericho Road the following day. She encouraged me to complete their online application so that they could review if SCHOOL, Inc. might meet their requirements in terms of becoming a new client. After submitting my application, I met with Melanie and have thus been working with Jericho Road for the past almost two years. I had never heard of such an organization like Jericho Road that supports the growth of nonprofits. The quality of professionals whom I have had the pleasure to work with has been astounding. Professionals in finance, marketing, digital SEO, web design, Google AdWords and grant writing consulting have given amazing time and effort to help bring SCHOOL, Inc. into our next phases of growth. I am honestly humbled by the earnest service and high level skill that SCHOOL, Inc. has received by these professionals. Melanie Goodyear and staff at Jericho Road have equally given exceptional professional guidance and support. We have more growth ahead for SCHOOL, Inc. and yet, I am filled with more knowledge, skill and confidence from working with Jericho Road. To recommend Jericho Road both in terms of professionals seeking to give back to their communities and for nonprofits seeking growth assistance is a resounding YES! We at SCHOOL, Inc. are very grateful. I began teaching Kids Yoga in my studio (Karuna Yoga) as well as in Los Angeles Unified School District classrooms in 2002. Due to more than 10,000 hours of teaching and training others, I have an expertise in teaching children not only the methods of yoga and meditation but just as importantly, the reasons for practicing in daily living. Perhaps master teacher is another way to state expertise here. Also from extensive experience, the SCHOOL Kids Yoga methods meet Common Core State Standards. Please enjoy the article and pass it along to teachers, parents and foundations. 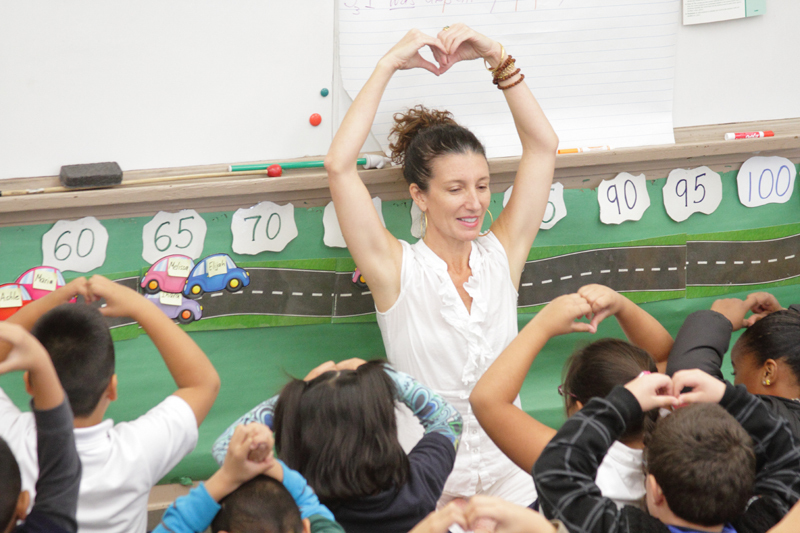 SCHOOL Kids Yoga provides classroom management methods for public school teachers so they can teach to the heart of students and encourage cooperation, kindness and group harmony. The Common Core State Standards provide benchmarks for learning by grade level, K-12. Teachers understandably like to have some level of freedom in how they deliver subject matter to students as their creativity and improvisation have the ability to heighten motivation to learn. Many teachers these days are finding the balance between meeting Common Core State Standards and bringing their unique teaching skills into the classroom. In simple terms, it seems to me that this balance is between structure and organic free flow. As we so often know, moment-to-moment balance between structure and play is key for classroom success both academically and socially speaking. We teachers strive again and again to hone our teaching proficiency by reviewing the day’s events in the classroom, weighing what appeared to help and what appeared to hamper students’ participation and subject matter comprehension. Refreshing our perspective is very much a necessity to learn and grow as an educator, to bring the dignity of teaching forward and the enthusiasm to learn alive. I created the SCHOOL Kids Yoga & Mindfulness Teacher Training as a new tool to gather the whole classroom of learners on equal ground with everyone's equal participation and equal value to the group. Likewise, each member of the class learns the responsibility to contribute constructively and respectively to the overall harmony with peers and the teacher. Bringing secular yoga into public school classrooms in 2002 (the year I began the SCHOOL Kids Yoga & Mindfulness program) was definitely a new and creative experience for myself, students and teachers. Over these last 15 years, I have paid careful and close attention to the needs and concerns of teachers and their commitment to successfully impart learning to students. I have fine-tuned SCHOOL Kids Yoga to make sense to Common Core State Standards while engaging classroom communities with new tools and in innovative ways. “In general, the standards are supported by the SCHOOL Kids Yoga practice by allowing tools for listening to peers, teacher, and constructive critique. It helps introduce academic and social skills vocabulary, make connections to stories, life experiences, and learning to speak with pace, expression, and intonation. In addition, students learn metacognition, developing memory, self-reflection, perseverance, and determination through focus and grounding.” - Mary G.
“School Kids Yoga supports the Common Core Standards by meeting state health and physical education requirements. In addition, the SCHOOL Kids Yoga methods address ELA standards for speaking and listening (e.g., applying rules for discussion, building on discussion, and asking and answering questions to clarify, ascertain key details, gather additional information, and provide descriptive detail). Furthermore, SCHOOL Kids Yoga supports learning of academic content through the use of models, verbal and visual aids.” - Vivian Z.
I created the SCHOOL Kids Yoga & Mindfulness Teacher Training to give teachers tools to not only improve focus in students and teach Common Core State Standards, but also to provide a means for teachers to gather themselves in the moment and refresh perspective. We teachers know the importance of maintaining grace and equilibrium - so often challenged in our diverse interactions with students. When teachers have practical tools to ground and gather themselves within the dynamic waves of energy and experience in the classroom setting, they are better able to find the balance between teaching the benchmarks of the Common Core Standards with a fresh perspective that invites their creativity and enthusiasm. Naturally, students pick-up on a teacher's warm engagement and thus, are drawn in to learn more. And this ability to navigate amidst our routines and the unknowns of life bring acalm sensibility that needs to be nurtured in our classrooms and communities throughout life. Mindfulness is quite popular these days. It is great to see more people interested in improving their daily lives by learning mindfulness practices. One of my teachers, exceptionally experienced in mindfulness practice with more than 40 years of sitting down and watching the breath, reminds us that the "product" of mindfulness does not quite fit in with the practice of mindfulness. For example, expecting mindfulness to erase our problems and make our days smoother is not how this contemplative practice works. Mindfulness can build confidence and faith in ourselves to stick-to-it, whatever "it" is that we want to either run from or give up on in life. We all know how exasperated we feel when life events do not go as we wish. A "whatever" attitude is quite pervasive these days when things don't unfold like we want. Most of us teachers experience difficult days in which we feel like giving up. Breathing and steadying ourselves and teaching children the same is crucial to navigate those moments when we feel like a huge hurdle blocks our path. Most of us, if not all of us, have to learn how to navigate through obstacles with a calm and caring attitude. That type of resilience that comes with a gentle tone must be nurtured and drawn out in ourselves so that we can stay connected with others. We will find slightly different definitions of mindfulness. The root, however, is cultivating awareness. Again, it is such a positive step in our society's evolution to have the yearning to know more. I was taught that mindfulness means "to see more" and from seeing more, it could be argued that knowledge increases. Our first impression of seeing more or knowing more may not be what brings us more peace, intrigue or ease in life. It is very important that when we engage in mindfulness practice we include a softer tone, a gentleness. To simply be more aware, more knowledgable may distance ourselves from others. To see that we have more in common with others than we initially think, is one of the cornerstones of mindfulness. When I was 9 years old, my family was vacationing at the beach in South Carolina. I was walking on the beach with my dad holding hands. I can still feel the comfort of this simple gesture, walking with my father, hand-in-hand, knowing that he loved me. Children find great comfort in the simple moments of life when they sense the attention and care of their family or care-givers is genuine. Seems to me, we respond favorably to this the of gentle interaction with others no matter what our age. I said to my dad, "! really want to be a genius!" This idea must have come from some impression that knowing more, being super smart was exciting or would make one successful in some way. My dad, so true to his gentle and balanced manner said, "No, my dear. You don't want to be a genius." I, of course, said, "Why not!" He said, "Because you will not be able to relate to others." Well, I am still moved by these words so many years later. With the mindfulness practice, we do want to see more, and by seeing more of how we move, think, feel, and speak, along with the intention of calm and kindness, we will enjoy relating more to people, during school and throughout life. Events that have happened for the first 4-5 years of s child’s live are out of our control. As teachers, what we can decidedly do is offer the self-regulating tools for them to use now, especially in the classroom. They will not change overnight, none of us do. They will go in and out of positive self-direction, like we also do. We need courage to not give up on them nor ourselves. I remind teachers that SCHOOL Yoga and Mindfulness methods, just like any other subject matter, requires consistent study, investigation, and application. Because children love to move around, the SCHOOL methods are inviting; however, I spend substantial time relating to the teachers how to maintain the balance between movement and self-discipline to their students. Not an easy task! But as with most rewarding things in life, we must practice again and again, override giving up or checking out, in order to strengthen the habits that bring more confidence and contentment. SCHOOL Kids Yoga & Mindfulness Teacher Training, is an adaptation of the yoga and meditation practice with mindfulness methods threaded throughout. A high priority of mine is the ability to relate this contemplative practice to children, teachers, parents, and administrators in a manner that makes sense for including the methods within the school day, as relevant subject matter, not an after school activity. I’ve created SCHOOL Yoga terminology, movements, motivations, and practicalities that relate easily and instantly to others. The SCHOOL Kids Yoga & Mindfulness Program is not what the general public perceives as yoga and mediation. Some of the movements are recognizable by traditional practitioners, however, the manner in which they are taught is unique. If this contemplative practice is integrated into the school day, it must make sense within a classroom and must look quite different from a yoga studio class. Children need consistent reminders of why yoga and meditation bring focus, well-being, and learning. The SCHOOL Yoga methods are not fun games and movements meant simply to relax children. The point is to tap into the ability to ground, steady, ad focus oneself in order to then strengthen the helpful motivations and behaviors that help children feel confident and demonstrate kindness. It is essential that positive behaviors, character building, and secular ethics are taught in ways that are embodied within children, not just in concept. Our days vary, along with our moods and experiences. The ability to focus and cultivate a gentle tone waxes and wanes for all of us. Mindfulness practice, if practiced consistently, can help balance our feelings and thoughts so that we learn over time to not get swept away with the rollercoaster of emotions and countless distractions maybe as often. We will experience ups and downs, so why not strengthen the ability to recognize when we are on the rollercoaster and gently steady ourselves? It is not an easy task but learned early in life, perhaps we would have a few less entangled habits to undo as the years go by. Life's complexity seems to be increasing. A practice to return to the simpleness of live and appreciation is greatly needed. The many teachers who take my SCHOOL Kids Yoga & Mindfulness Training are exemplary. They are overall, new to yoga and meditation with a large percentage having zero to very little experience in this field. They are often times seasoned with over 12 years of teaching experience, with some over 20 years in the classroom. They share in our training course that the ability to manage their classroom has been presenting many challenges and their usual way of management and discipline are not producing favorable results. They express a deep concern for the well-being of their students. These teachers also share that they want to continue to improve their teaching proficiency. We can easily say that these teachers have reached a point of wanting to step into new ground, opening themselves to new methods. In my 25 years of practicing yoga and meditation, I know this "new ground" state as beginner’s mind. It is a keystone to mindfulness. It is common for adults to learn yoga and recognize benefits which compels consistent practice. However, in today’s yoga classes for adults, if the adult students do not constantly refresh the beginner’s mindset and practice instead with the main intent of achieving poses and flexibility, their yoga teacher has most likely fallen short in their skill or the student has not truly listened in class. To more properly practice yoga and meditation is to develop improved self-direction, which means the physical use of the body, the ability to recognize feelings and thoughts without necessarily jumping into reaction, and to strengthen the motivations that are helpful to oneself and others, like patience. We can see that this endeavor is comprehensive as it calls us to take an honest look at ourselves, with a gentle tone. Being simple, speaking gently, and relating to people is an art form and like any artful skill, must be practiced. The nested heart image below was given as a gift to me this afternoon by a fourth grade girl. On her own, she must have been motivated to express kindness. The children I teach do not know the depth of gratitude I feel from each drawing, letter, eraser, and more little everyday items that I have been given. Every gift is kept and cherished. The simple moments of life, experienced with awareness and gentleness helps grow mindful caring people. Let's start early and teach our youth mindfulness in school. The SCHOOL Kids Yoga & Mindfulness methods very effectively relate to under-served children, those living in inner-cities with many adverse conditions present in their homes and neighborhoods. Our simple SCHOOL Kids Yoga & Mindfulness calming techniques develop resilience, compassion, and coping skills for youth to navigate more constructively through adversity. Once children learn how they themselves can approach a problem with calm thinking and helpful motivations, self-confidence increases and academic performance has the possibility to improve. Each time I go into a classroom, I have the honor of sitting in front of 25 or more children, eagerly awaiting the SCHOOL Kids Yoga class. Typical Los Angeles classrooms include racial diversity with the majority of Hispanic students. Having taught in Los Angeles public schools for 14 years, I have observed and responded to the common ground understanding of children of diverse cultures. Recently, I chose two students after class to come up to the front and together put the many hearts I have placed by my mat back into the straw basket I carry with me into schools. In today's Pre-K class, I chose two girls to help. One of the little girls has a slight learning delay. As they both carefully worked together to place the hearts in the basket, the little one the the learning delay picked up the last heart. Instead of placing the heart in the basket herself, she handed it to the other girl so she could place the last heart in the basket. I have watched many students give the last cherished heart to their classmate. The depth of simple kindness, sharing and togetherness the inner-city children possess is profound. I was, and still am, moved to tears to watch these acts of kindness. How can we stand back and hope/assume that the basic good qualities that children possess will grow and strengthen as time go on, given the adverse conditions they experience every day and at such a young age? We can't take for granted that social and emotional learning will grow on its own. Now is the time in education that we nurture kindness in order to grow caring communities. Let us not wait until it is too late. Let us be proactive about helping our dedicated teachers and children. A first grade boy, attending an inner-city school, also moved me to tears one day. He is usually positioned on the front row when we sit down on the reading rug for our SCHOOL class. This day, he was sitting on the third row. He had taken to the calming methods very well and despite his learning delays, was demonstrating what I know to be true from my 14 years of experience - that all children have the opportunity to participate equally within the context of calm breathing, moving, and positive affirmations. I was selecting a student who was raising their hand to sit beside me on my mat to help teach the next part of the class. I called on this little boy to help me. He popped up happily to walk forward to my mat while saying, "Thank you, Ms. Kelly, for choosing me." He expressed such genuine gratitude and he was wonderful in leading the group. We teachers are so very inspired when we see the motivation to learn shine through in our students. Teaching social and emotional regulation in classrooms is an important element to teacher's efficacy and students absorption of knowledge. In SCHOOL Kids Yoga & Mindfulness classes, we sit down together - recalling our common ground. Remembering that we are all much more alike than different, we are soothed and comforted. This is the point from which life learning expands. Today’s teaching schedule included seven SCHOOL Kids Yoga & Mindfulness classes in three different schools. As I walked into the sixth class, the second graders were scampering to follow their wonderful public school teacher’s instructions to close their books, put pencils onto the top of their notebooks, push in their chairs, and make their way to the rug for our SCHOOL Kids Yoga & Mindfulness class. I walk by children moving here and there, and notice one girl nervously holding something small wrapped within the hem of her shirt. Her eyes indicate a humble knowing of some sort. Being used to seeing various items in children’s hands like paper clips, toys, rubber bands, headbands and more, I make a mental note that if the fidgeting hands continue once class starts, I will ask her to place the mystery item away at her desk so that she can give her full attention to our mindfulness class. I believe that every child has the potential to develop self-regulation skills and I hold high standards that their mindful or compassionate self-direction is within their reach. If I can learn how to practice self-discipline and emotional/mental regulation, then they can as well. I simply have forty years of living ahead of these amazing children, pursuing the path of self-reliance. Constructive self-reliance is one of the most important skills we can teach our children. The SCHOOL Kids Yoga & Mindfulness classes include positive self-reliance at its core. Increasing the ability to positively self-regulate is, of course, a priority of all good teachers. And we teachers, also take seriously the need to continually work our our ability to positively relate to students and not only model compassion, but provide tools for students to grow compassion. The SCHOOL Kids Yoga & Mindfulness Teacher Training, whether online or in-person, gives public school educators the skills to teach compassionate self-reliance to their students and also for themselves. This second grade girl will never know the full impact of her heartful gesture of giving. Tears repeatedly come to my eyes thinking of the goodness of this child and the motivation to act on this goodness. The children teach me and I am humbled in each class. We teachers repeat and repeat and keep the faith that the seeds we are planting will ripen and grow within our children. Today’s heartfelt gift has planted a seed of inspiration within me that I will always cherish. Thank you, Kimberly. What an honor! Moksha Festival 2013 is a high profile event in Southern California that celebrates yoga, music and healing arts for the well-being of our communities. A member of the SCHOOL, Inc Board of Directors, Irene Lara, nominated me for the Yoga Activist Award. I was and remain so elated to receive this award. When Arvind Chittumalla, CEO of Moksha Festival, announced the winner and gave me an opportunity to speak, I shared how going into public schools and teaching yoga and meditation to underserved children is to help increase learning within the classrooms. Once a child lessens distraction, nervousness and aggression, we see a more gentle attitude spring forth. We notice ears that listen better to their teacher's words. We notice more harmony within the group and a willingness to collaborate. SCHOOL classes are essential for my well-being. Knowing how the practice of breathing calmly and learning how to pause and consider the heart of another continues to help me, there is zero hesitation in sharing these calming techniques with children and public school teachers. Often, I am so moved by observing a classroom of 30 elementary school children taking a calm breath in and out, that tears spring forth from my eyes. I wish you could see what I see on a daily basis - children interested in creating a calm heart, interested in healthy eating and living and creating stronger habits to not react but to help others. Thank you Arvind Chittumalla and Moksha Festival 2013. We keep breathing calmly. SCHOOL Yoga & Mindfulness classes emphasize calm and concentration, both essential qualities for learning. Additional elements of SCHOOL Yoga classes include storytelling, positive affirmations and knowing how to turn a destructive reaction into a moment of pause. Kids are taught the importance of a calm body, calm brain and calm heart. In addition to learning to concentrate on the task at hand, they also learn how to pay more attention to the hearts of other. Thus, they learn how everyone feels better helping or being helped. We teach kids values such as patience and compassion. We also teach life skills such as listening, pause and slowing down. Children learn that calm breathing is the first step to think more clearly and make good choices. Children learn certain movements that help to calm their feelings. We encourage strong and caring world citizens who develop self-reliance and resilience. Whole brain functioning is addresses through movement, focus and sound. The SCHOOL Yoga methods include specific movements that contribute to brain balance. Whole heart functioning is developed, taking a more compassionate and respectful approach to others. The importance of breathing to steady heart rate is key to our SCHOOL Kids Yoga & Mindfulness methods. SCHOOL Yoga classes are designed to grow the motivation to use a calm breathing within the classroom. We encourage the importance of listening to one's classroom teacher. With increased listening and empathy within the classroom, student to student and student to teacher, motivation for both teaching and learning strengthens and our public schools flourish. Academic achievement combined with character building brings greater confidence to children and youth. To overlook character building will overlook compassion. The ability to listen to another's point of view or t listen to the teacher's direction helps us feel connected and part of the group of learners. With endless distraction today, the art of listening is crucial so that we can express kinder thoughts, words and actions at school and in life. Teaching yoga to adults and to children is very rewarding. The art of yoga helps me refine the art of living. My motivation to help others learn how to center and calm themselves continues to grow as my own practice grows. We adults have many habits that have been reinforced over the years. So many of us who find yoga in our adult years, begin to see the physically, mentally and emotionally knots we carry. The practice assists us in unraveling these knots. This a slow process. With continuity of practice, however, one may experience more openness that is not simply a few moments of equanimity directly after a yoga class. One's behavior begins to reflect the teachings of yoga. The way in which our brain develops in childhood points to open times of plasticity in which our experiences have great impact on our habits, our personalities. Teaching children the value, the necessity of calm breathing helps fire up neural pathways that can help a child think more automatically about pausing, breathing and making good choices. Knowing that a calm body, brain and heart are important facets of ourselves to attend to each day, may help children take yoga seriously and make it a part of their daily routine. Yoga is not something to do for fun or when we get around to it. It is a life practice. I look out into the faces of these 800+ beautiful children each week and hold in my heart that we are helping to cultivate members of our community who can pause, think calmly and help others. In a nutshell, children tend to be more open to the practice, less doubts and misunderstandings. I teach SCHOOL Kids Yoga in a similar way as adult yoga. We begin with a story or something in daily life that draws a parallel to using yoga in our actions, thoughts and words. I emphasize pausing, taking a calm breath in order to help the brain work better. I want to help children know how to focus with the flood of ongoing distractions so that they develop motivation to learn from their teachers. Perhaps we will encourage children to become future teachers, motivated to help others learn and grow. 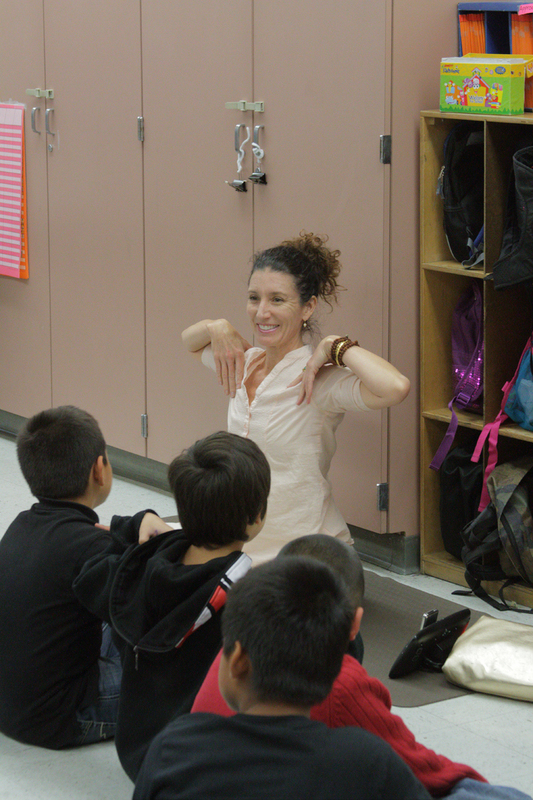 Bringing the Art of Yoga to Children in Public Schools. Kelly Teaching Weekly Class in an Inner-City Los Angeles Public School. Teaching 4th graders how our calm breathing helps our hearts shine. When the heart is calm, we can listen, remember and learn. When teaching children, as one might expect, elements of fun are included in order to engage their attention. I feel it is a priority for the Kids Yoga teacher to consider how children are relating to the practice and to put themselves in the shoes of their students. What kind of memories, associations and meanings are we Kids Yoga Teachers planting within children's minds? Children must make the connection of why they are executing postures and why they are sitting down to meditate. They need to know the real life benefit of poses. It is not so much the yoga poses that must be remembered by children when they are feeling anxious, insecure, tired and irritated. They must remember their breath as the first step to centering their attention and emotions. We teach children to remember that the body, brain and heart need care every day. Let's start the healthy habit of calm breathing and self-reliance in the formative years. Let's start the habit of respect for others and for oneself in Kindergarten. As Kids Yoga teachers, we must repeat the basic benefits of creating healthy bodies and calm brains for healthy choices. It is not enough to stop with these two benefits. Children must understand that the essence of practice is to steady oneself in order to be of help to others. As Kids Yoga Teachers, we must teach to the hearts of children. A calm heart relates to a caring attitude, naturally wanting to reach out and be of help to others. Being strong means listening to others, accepting others and extending a helping hand. We all have a heart. We all want to relate and to belong in our communities. We all breathe. Teaching children the value of a calm heart is crucial today. As we teach Kid Yoga and Kids Meditation within public classrooms, we repeat time and time again, to start with one calm breath in order to steady the heart. When our thinking aligns with the heart, our viewpoints are much more inclusive and caring.